Earth's climate is always changing. As the debate over the Earth's climate has grown, the term "climate change" has come to refer primarily to changes we've seen over recent years and those that are predicted to be coming, mainly as a result of human behavior. 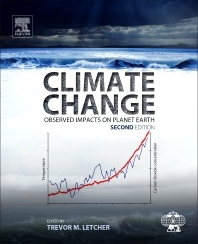 Climate Change: Observed Impacts on Planet Earth, Second Edition, serves as a broad, accessible guide to the science behind this often political and heated debate by providing scientific detail and evidence in language that is clear to both the climatologist and the non-specialist. The book contains 35 chapters on all scientific aspects of climate change, written by the world's authority of each particular subject. It collects the latest information on all of these topics in one volume. In this way, readers can make connections between the various topics covered in the book, leading to new ways of solving problems and looking at related issues. The book also contains major references and details for further research and understanding on all issues related to climate change, giving a clear indication of a looming crisis in global warming and climate change. 5. What Is Happening to the Ice? 1. Introduction: How Does Climate Impact Mammals? 2. Is Sea Level Rising? 3. Why Is Sea Level Rising? 4. Are Contemporary Rates of Sea Level Rise Unusual? 5. Has Anything Changed in the Last Decade? Trevor M Letcher is Emeritus Professor of Chemistry at the University of KwaZulu-Natal, Durban and a Fellow of the Royal Society of Chemistry. He is a past Director of the International Association of Chemical Thermodynamics and his research involves the thermodynamics of liquid mixtures and energy from landfill. He was awarded the South African Chemical Institute’s Gold medal in 1999 and in 2000 he was awarded the South African Gold medal by the South African Association for the Advancement of Science. He has published over 250 papers in peer review journals and has edited, co-edited and written eleven books in his research and related fields. His latest books include Unraveling Environmental Disasters (2012), Materials for a Sustainable Future (2012), Waste (2011), Heat Capacities (2010), Climate Change (2009) and Future Energy (2008).